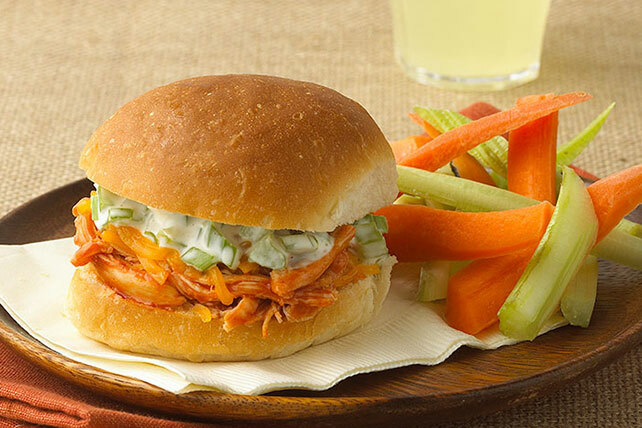 Get the party started with Buffalo Chicken Party Sandwiches in just 20 minutes! These party sandwiches provide the tasty flavors of wings without the mess. Cook chicken, sauce and water in saucepan on medium heat 5 min. or until heated through, stirring occasionally. Meanwhile, mix mayo, dressing, celery and blue cheese. Fill buns with chicken mixture, cheddar and mayo mixture. Prepare using KRAFT Light Mayo Reduced Fat Mayonnaise, KRAFT Lite Ranch Dressing and KRAFT 2% Milk Shredded Cheddar Cheese. An easy way to get the shredded cooked chicken is to use a rotisserie chicken purchased from your grocery store. Just shred it with 2 forks. You should easily be able to get 4 cups shredded meat from 1 rotisserie-cooked chicken. Cook chicken mixture as directed; spoon into slow cooker set on LOW. Place buns in lined basket; surround with bowls filled with celery mixture and shredded cheese. Invite your guests to serve themselves so you can also enjoy the party.